Epiphone has just launched a new Firebird-style limited edition custom guitar. Street prices are already much lower than the £439 guide, so what are you waiting for? Neat construction. Looks. Playing experience. Some players will want to adjust the strap button position. 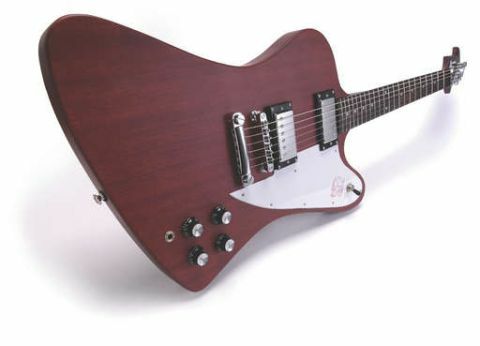 The Gibson Firebird Studio has found favour with many players, not least a certain Mr David Grohl, so it makes perfect sense that an Epiphone interpretation should appear. The Studio retains the reverse outline and classic stylings, while dispensing with quirkier aspects of the original Firebird design such as mini-humbuckers and banjo tuners. Unlike the Gibson Studio's mini-Grovers, the Epiphone's headstock is coolly adorned with six Steinberger 40:1 direct drive machineheads that take a little getting used to but work very well indeed. The mahogany body is constructed from several sections of timber, but veneers on the top and back have an attractive grain and give a one-piece appearance. In addition, the neck has a sumptuous, addictive quality with its reassuring, yet not intimidating girth. Acoustically, the Epiphone has more resonance and sustain than many Gibson Firebirds we have played, and happily this translates into a bright but powerful tonality from the Alnico Classic humbuckers that can handle grunge riffing as readily as arpeggiated clean parts or juicy blues. Emblazoned with 'Limited Edition' and 'Custom Shop' decals on the rear of the headstock, it may not linger in the Epiphone catalogue for too long, so check this one out quickly.